The world is comprised of various religions. While many individuals adhere to the same or similar beliefs, others do not. Depending on a person’s background, environment, ethnicity, as well as many other societal and personal factors, some people often have more knowledge of the various worship practices and rituals among churches. Confirmation is a religious rite of passage practiced primarily by a variety of Christian groups including Anglicans, Catholics, and Orthodox churches. An initiation into the Catholic Church, Confirmation is the second of the three rites of the sacrament, and an affirmation of baptism, the first rite. The last and third rite of passage is the First Holy Communion. The experience brings the individual, who is most often a teenager, closer to God and strengthens their faith in the higher power. Since this ceremony is such an important turning point in strengthening a Christian’s spirituality and symbolizes rebirth through the Body of Christ, choosing a special and meaningful gift for the believer is essential. The following list will present six of the best gift ideas suitable for this kind of celebration, but if you’re looking for more inspiration, be sure to check out Ten Gift Ideas for some of the most original confirmation gift ideas for boys. Is there a better gesture to memorialize this important milestone in a teen boy’s life? A personalized and engraved compass is a great confirmation gift idea for a boy and the ideal reminder that the teen will always travel in the right direction when following the steps of Christ. Crafted of brass and finished in rosewood, the compass is an exquisite sentiment to celebrate the occasion. Available in sets of two, these personalized necklaces may be worn by the male being confirmed and the Confirmation Sponsor. Each tag is engraved with the important date of the ceremony, a religious passage, and symbols, as well as the names of the confirmed and his sponsor. Available in various styles and finishes, these wooden, silver, stainless steel, or pewter keepsake boxes are an excellent reminder of this important day in your boy’s life. Each is etched with the name of the confirmed (or other meaningful words), a religious scripture, and decorative symbols. These keepsake boxes may be used to hold other gifts for the confirmed youth or as a gift alone to safely store mementos from the sacred occasion. They are the perfect place to store rosaries and are also available with velvet lining. Ensure your loved one’s memories from the sacred event are preserved in a beautifully finished wooden photo album inscribed with the confirmed’s name, date of confirmation, and a memorable verse or religious symbols. There are a variety of photo albums also crafted in fine leather, pewter, stainless steel, or silver, as well as personalized frame and photo album sets available to commemorate the occasion. This gorgeous tie is handmade of 100% silk and includes a ‘hidden’ pocket to place personal messages or scriptures. It also includes 25 paper hearts to write those special, sentimental notes, as well as an engraved nickel heart charm. 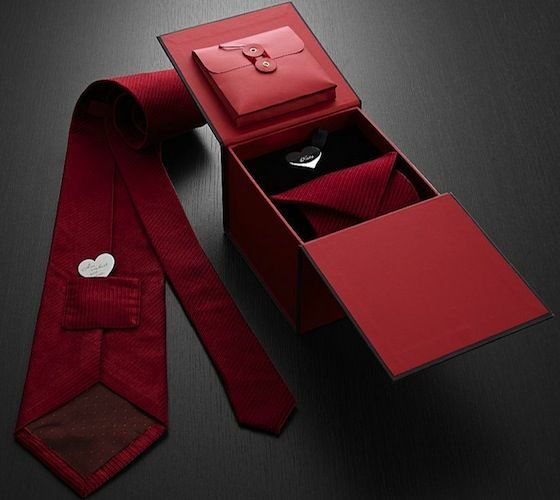 Exquisitely displayed in a red gift box trimmed in black (which may be engraved with the confirmed’s name or other meaningful words) this gift is sure to grab everyone’s attention any time it is worn by the confirmed. What better way to celebrate the youth’s confirmation in Christ than with a personalized Bible. This Bible, covered in elegant red damask is a constant reminder of the confirmed’s new dedication to spiritual growth and a closer walk with Christ. The cover may be personalized with the name of the confirmed, the date of the Confirmation ceremony, and engraved with a dove – symbolic of peace and representing the Holy Spirit. The New American Bible Revised Edition (NABRE)is the most up-to-date and accurate version compiled by a multitude of biblical scholars and includes commentary, Mass readings, Sunday readings, and an assortment of memorable prayers. The confirmed youth is sure to cherish this remarkable gift for many years ahead.